Nearly 30 million Americans have impaired hearing - that's one in ten of the general population and one in three persons over the age of 60. Medical devices such as hearing aids and rehabilitation can substantially reduce hearing loss in the vast majority of patients. Dallas ENT Head & Neck Surgery Center is a full service provider of both hearing services. This includes evaluation and treatment for ear pain, hearing loss, and ringing in the ears (tinnitus). Our friendly, professional staff is available to provide a full range of diagnostic testing and, when necessary, state-of-the-art hearing aids. 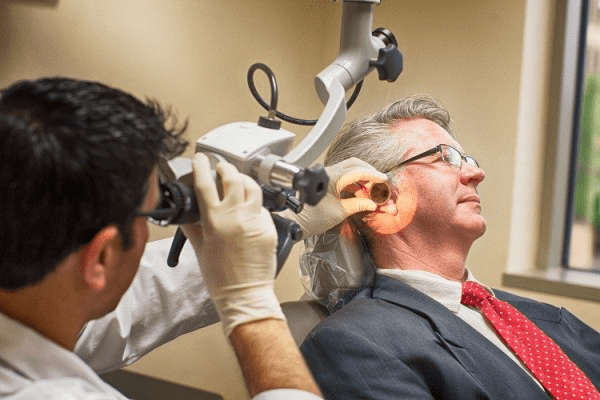 Our board-certified Ear, Nose and Throat specialists, as well as our staff of licensed audiologists, are dedicated to providing you with outstanding clinical excellence and customer service. Physicians classify hearing loss as either "conductive" or "sensorineural." A hearing loss is conductive when there is a problem with the ear canal, the eardrum and/or the middle ear including the three bones connected to the eardrum. Common reasons for this type of hearing loss are a plug of excess wax in the ear canal or fluid behind the eardrum. Medical treatment or surgery may be available for these and more complex forms of conductive hearing loss. A hearing loss is sensorineural when it results from damage to the inner ear (cochlea) or auditory nerve, often as a result of the aging process and/or noise exposure. Sounds may be unclear and/or too soft. Sensitivity to loud sounds may occur. Medical or surgical intervention cannot correct most sensorineural hearing losses. However, hearing aids may help you reclaim some sounds that you are missing as a result of nerve deafness. A mixed hearing loss is a combination of both conductive and sensorineural type hearing problems.